urgh... Newcomer here, great to be in Minitokyo. Okay, Let's just go to the main point. Here's the wallpaper that features the new Hellsing: Ultimate character and looks! Browse Hellsing Gallery: Recent | Popular. A nice set of pictures, thanks for uploading the wallpaper. I must say that I am quite excited for the new Hellsing OVA, as it looks as if it will follow the manga. Thanks again, sargesagara. I found myself a new wallpaper. Yeah, me too. I'm looking forward for mew Hellsing. Wallpaper is quite nice. Oh, I have to say that I like it. 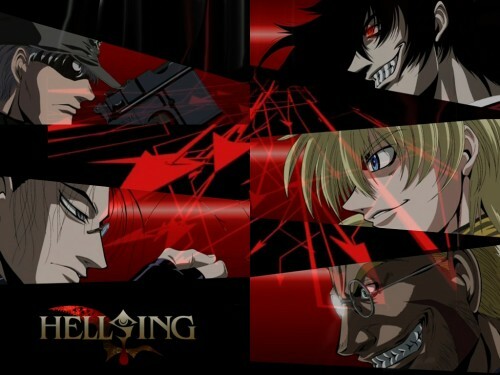 wow :nerd: is it for real is there a project or something about a new hellsing anime? your wallp. is a breathtaking one really awesome, thanx for sharing thumbs up! Quote by gaigarwow :nerd: is it for real is there a project or something about a new hellsing anime? Yeah, it's for real. I managed to get the official trailer from BT, and it will be released in 9th December 2005, as stated by the trailer. This is a nice wallpaper. It reminds me of a fighting game or something. I like it. I'm really looking forward to the new Hellsing OVA, too. The wallpaper does look like a Vs. screen on a possible Hellsing fighting game. Anyway, heres one for favorites. Great. awesome i like this wall a lot. hell yeah! this one sure goes to my fav. yeah i'm looking for the OVA too. Realmente buen trabajo .. hellsing es el mejor ..